This basket is sure to make a huge first, second and third impression. 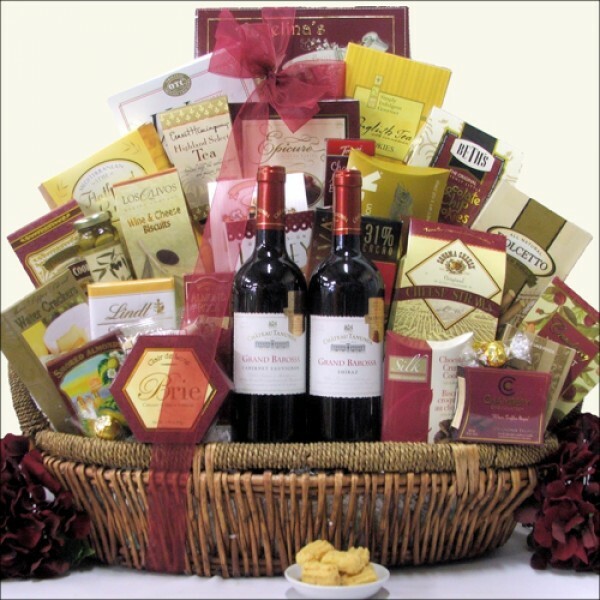 The 'Chateau Tanuda Grand Barossa Classic Duet' wine gift basket makes its first impression in the 2 bottles of red wine that are featured. Both the Shiraz and Cabernet Sauvignon have a delicious intensity and aromas of dark berry fruits. The second impression is the wonderful selection of Cheeses, Crackers, Salmon, Snacks, Chocolate and so much more. Lastly the third impression is the beautiful way in which this basket is arranged in a Oval Gift Basket with a Seagrass Rim, tied beautifully with a matching ribbon.